These 2 CDs, recorded in September 1997, combine with distinctive charm 'Die schöne Magelone and Count Peter of Provence' by Ludwig Tieck and 15 Romanzen of Johannes Brahms. Tieck’s novella is based on a chivalric romance from the 14th century, which is in turn itself based on a saga from Provence. It tells the story of the knight Peter, victorious in his every tournament. It tells of his travels, of his courting of Magelone, the beautiful princess of Naples, of her kidnapping, their separation and the lovers’ happy reunification after numerous adventures. The peculiar poetry of these lied Texts, their emotional variety and unusual form impressed the young Johannes Brahms who set the songs to music. 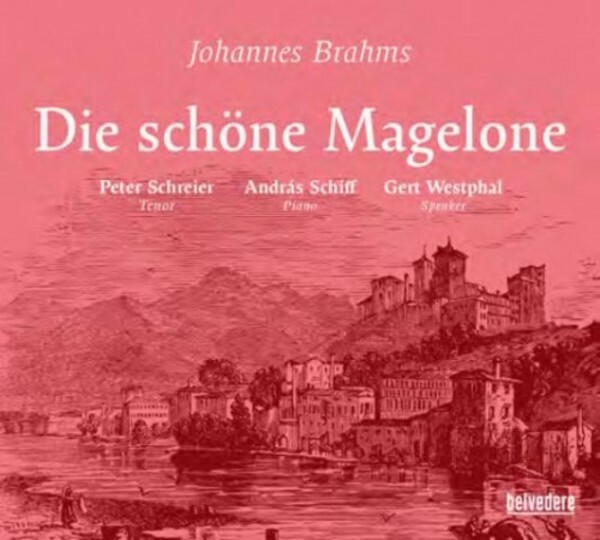 The 15 Romanzen aus 'Die schöne Magelone' was published as Opus 33 in 1869. Gert Westphal's inimitable speaking voice expresses the innocence of the fairy tale as well as the archaic literary language of Ludwig Tieck. Spirited, trenchant yet not overdone, this experienced reciter enables listeners to experience the external and internal events of the story making the dramatic and emotional settings of the songs understandable. András Schiff elevates his piano part far above the average lieder accompanist, with playing that encompasses the entire spectrum from lyrical tenderness to powerfully intensified drama. The partnership with Peter Schreier is a rare example of high art: Schreier becomes the knight Peter completely. His extreme outbursts of emotion demonstrate his high ranking as one of the most versatile and skilled singers of the 20th century.